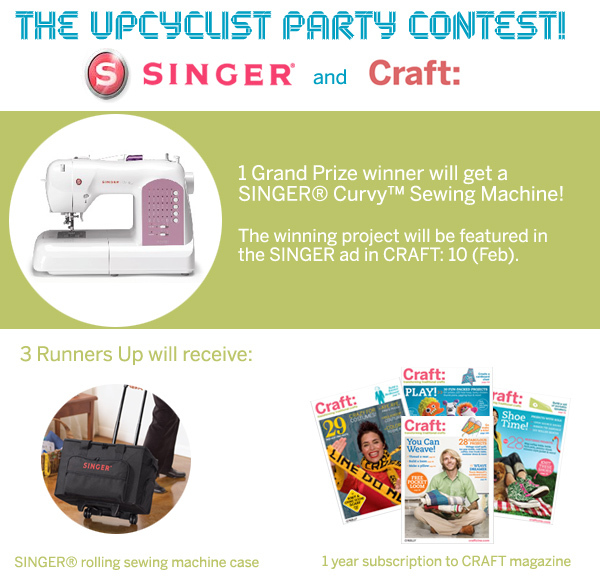 There’s still time to enter the The Upcyclist Party Contest brought to you by SINGER® Sewing Company and CRAFT Magazine. Both SINGER and CRAFT like a good party but hate to waste resources on disposable decorations that just end up in landfills. We know you can help us come up with fantastic ideas that are hip and cool as well as eco-friendly. During the contest period, crafters can submit pictures online of party decorations that they have made from “upcycled” materials (or things that they already have in the house) to the flickr group called ‘The Upcyclist Party Contest‘. At the end of contest, SINGER will pick one Grand Prize winner and three runners-up. The deadline for the contest is on November 4th at 11:59 PM ET. The Grand Prize winner’s project will be featured in the SINGER® ad in the February issue of CRAFT Magazine. The Grand Prize winner will also receive one (1) SINGER® Curvy™ Sewing Machine with a retail value of $399. Three (3) runners-up will receive a SINGER® rolling sewing machine case ($79.99) and a subscription to CRAFT Magazine.